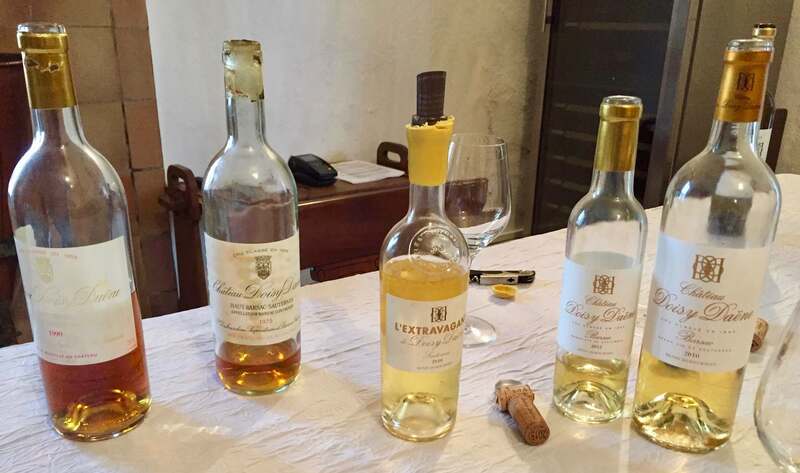 The Sauternes region is a famous sweet wine area worldwide where you’ll find the village of Barsac. But many don’t know this is a “sister” appellation to Sauternes; I didn’t until we moved to Bordeaux. Barsac is, in fact, a smaller and separate appellation and one that can label its sweet wine “Barsac” or “Sauternes”- it’s that good. This month our French Winophiles group steers away from dry style wines. We’re ending 2017 on a sweet note, one that can be just as big and structured, or dainty and elegant. Come with me to Château Doisy-Daëne in Barsac and let me indulge you in a favorite wine. The “Bordelaise” know Barsac for its red sandy clay soils overlying limestone. This “cooler” type of soil absorbs and retains water from winter rains, slowly releasing it during the dry summer when the ground can become parched (especially in recent years). 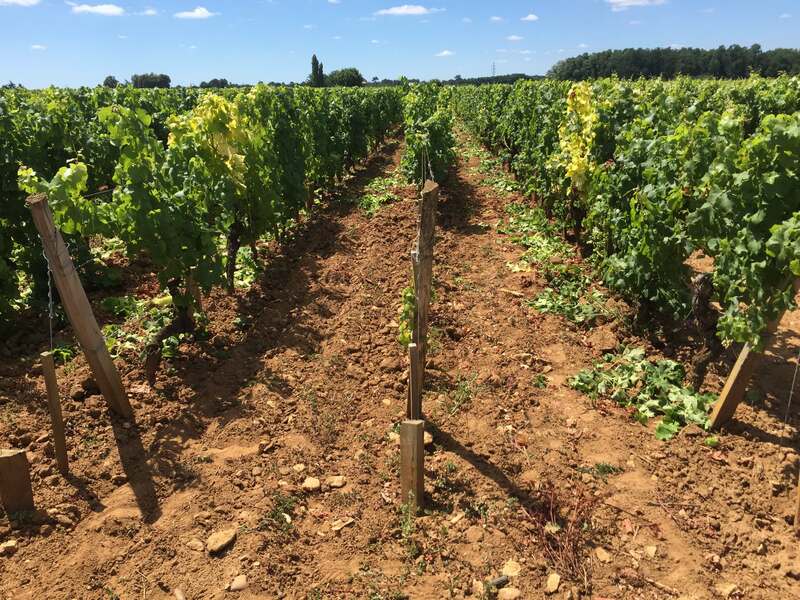 It produces rich, structured, and aromatic wines, that are generally fresher and lighter with higher acidity than wines from the other areas in the Sauternes region. These soils are shallow, just 50-80cm (1 1/2 to 2 1/2 feet), on top of limestone. Tasting our way up the Mosel River in Germany years ago introduced us to noble rot. I’d heard of Beerenauslese and Trockenbeerenauslese wines, and that weird sounding fungus so important to their success. We sipped and discussed sweetly intense wines developing an appreciation for their time and place. Barsac and most of the larger Sauternes area experience that same fungus and a similar unique microclimate. The interaction between the warm Garonne River and its cooler tributary the Ciron affect both areas— this is an advantage. 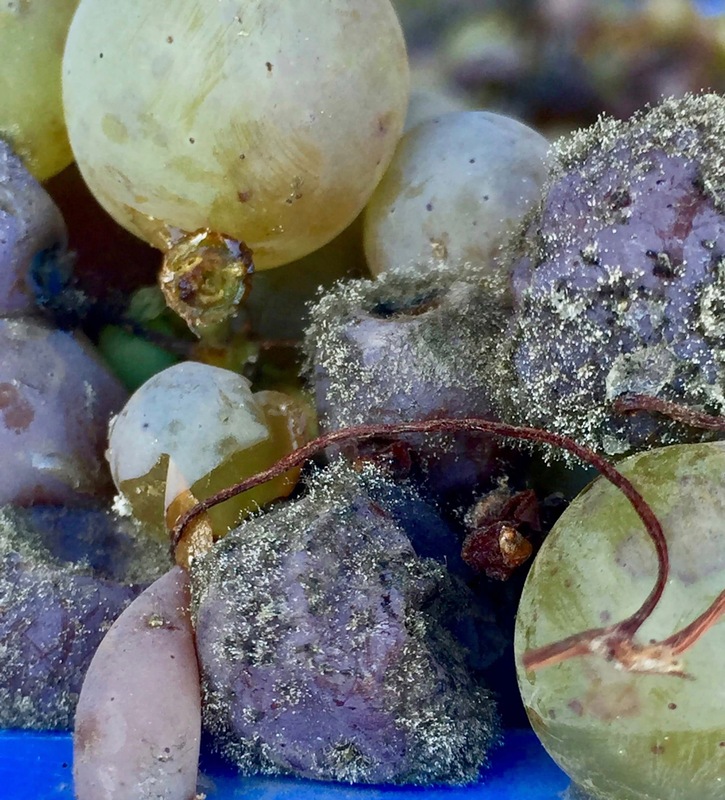 In the fall, when the Ciron mixes with the Garonne, it creates foggy conditions important for noble rot (botrytis) development on the grapes used for sweet wines. Botrytis loves cool mornings and those warm, sunny, dry afternoons which keep the botrytis working but in check. Sounds pretty inviting to me… the weather part! Mark spent time in and around Barsac with Domaines Dubourdieu doing internship work last year. And I got to know one winery and it’s sweet wine. Château Doisy-Daëne began producing wine; they are ranked as Second Growth (Deuxième Cru) under the Bordeaux Wine Official Classification of 1855. George Dubourdieu purchased the chateau in 1924, and in 1949 his son Pierre Dubourdieu took over. In the 1950’s, Pierre’s son Denis Dubourdieu started working with him, refining and improving the Château Doisy-Daëne Sauternes style wine, a type of Vin Liquoreux. Denis Dubourdieu is the famous winemaker and researcher who focused on the improvement of white wines in Bordeaux; he took white wine from how it was traditionally made- soft and slightly oxidized- to the modern minerally brisk style with minimal oak aging. Believing Bordeaux needed a top-notch research institute, he was instrumental in the creation of the Institute de Sciences de Vigne et du Vin (ISVV) in Bordeaux (and its director), and Decanter’s Man of the Year in 2016. History repeated itself when Denis took over management and operation of Château Doisy-Daëne in 2000. Keeping it in the family, his two sons, Jean-Jacques and Fabrice assumed responsibility for running the château after his passing in 2016. I was thrilled to taste the Doisy-Daëne Barsac wine with Jean-Jacques Dubourdieu shown here at a recent Bordeaux tasting. 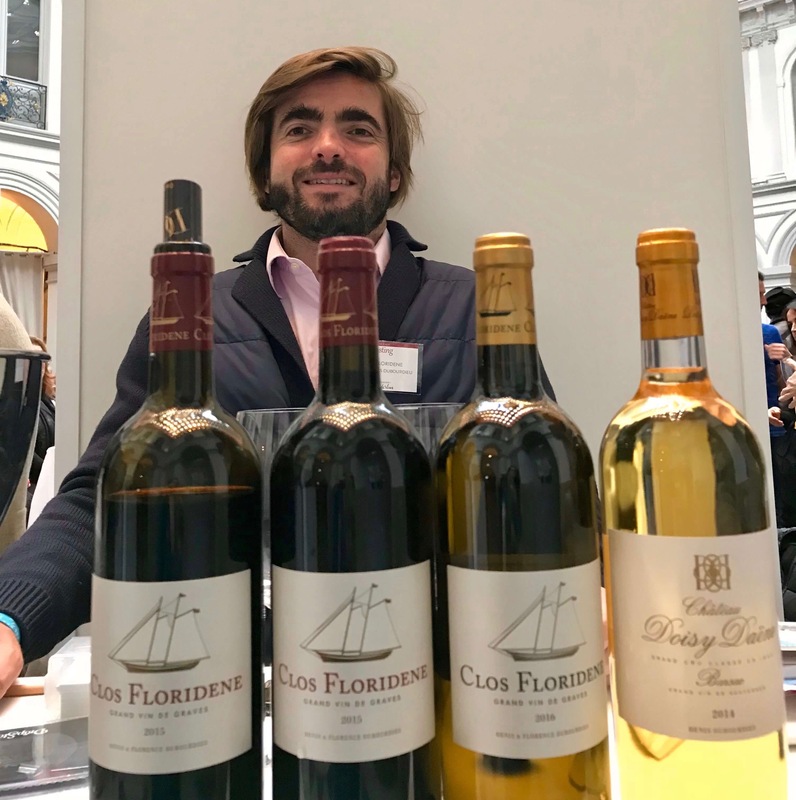 Clos Floridène is another estate owned by his family. Two sweet and one dry white wine are made at the Château. I’m focusing on the mainstay, which in keeping with how Bordeaux wines are named, is simply called “Château Doisy-Daëne Barsac”. 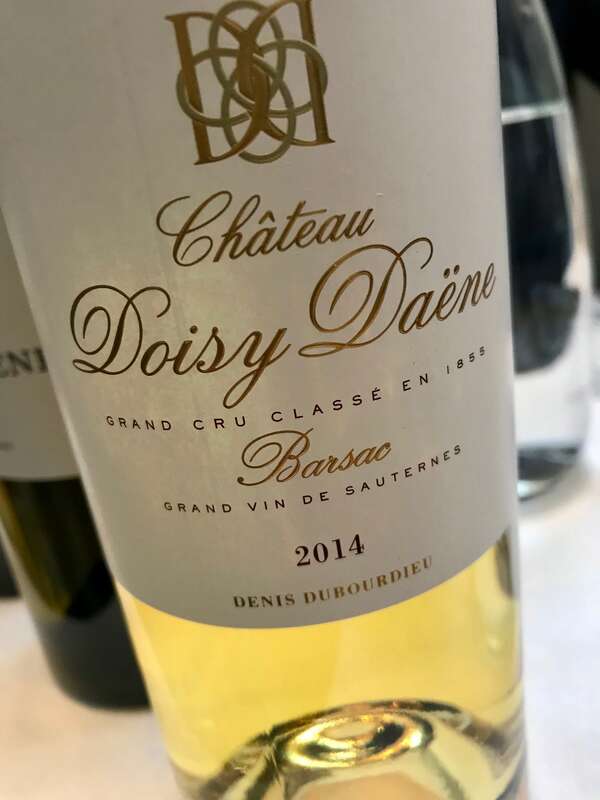 Doisy-Daëne is an excellent example and considered among the top producers of a Barsac Sauternes style of wine. Anytime you see “Barsac” on a label you know it’s a sweet wine. Mark tasted a handful of Doisy-Daëne vintages during his internship… I was lucky to sip the 2010 at a recent event. What struck me was the wine’s freshness. With a pale gold hue, this particular vintage is refined yet focused: discrete tropical flower notes follow honeysuckle, peach and mango. A sip revealed faint vanilla, slight spice, and wonderful length with just enough acid to balance the sweetness. Definitely elegant! Considered a baby, the 2010 can age from 10 up to 30+ years, developing additional characteristics as it ages, and turning a deeper brassy gold like the bottles on the left. Our challenge will be to set a bottle aside for another 20 years! I have to mention the second sweet wine, one we’ve not tried but is on our wish list. L’Extravagant, (in the middle of the above picture) is very exclusive with just a small amount produced in select years. Instead of making the traditional three passes through the vineyard to pick only botrytized grapes, they wait until the entire cluster is affected by the fungus. It has higher sugar levels with an unctuous mouth feel yet ample acidity for balance, according to Jean-Jacques. Hopefully one day! Doisy-Daëne does not use chemical herbicides. They don’t grow cover crops between vine rows either but instead employ both traditional and modern methods to keep the soil clear of weeds. And composting facility is on the family’s Clos Floridene property- it accepts prunings, pressed grape skins, and other organic waste from their vineyards and cellars throughout the year. The facility produces a whopping 60 tons of compost annually that’s used in the vineyards. 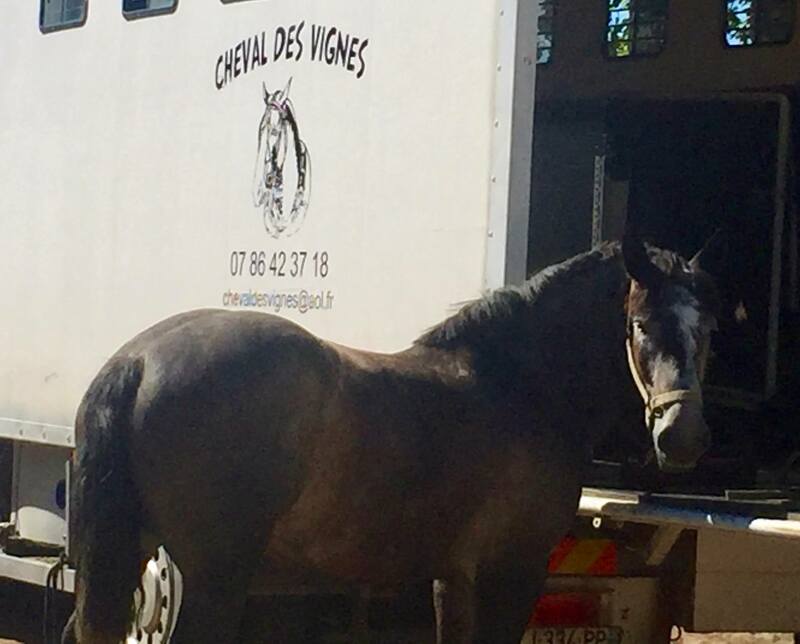 Horses are used to plow portions of the Doisy-Daëne vineyards. In fact it’s getting so popular you can rent a horse specifically for vineyard plowing! We’re lucky we’ve tasted lots of sweet Bordeaux wine over the last two years. When reaching for a bottle we gravitate towards Barsac finding the slightly increased acidity level more to our liking. The Château Doisy-Daëne Barsac is one of them, full of family history and passion, not to mention it has a great quality-to-price ratio. We’re sharing a few bottles of it with family this Christmas, along with a great story (full of hard work… did I mention Mark lost 12 pounds during his internship?!?). The French Winophiles share sweet adventures at the links below- hope you enjoy them! Our live twitter chat is Saturday, December 16 at 11:00 am ET / 5:00 p.m. in France using the hashtag #winophiles. Anyone is welcome to follow along and comment. Thank you to all who’ve supported Mark and I, and Savor the Harvest. We wish you happy holidays! Nice post, Lynn. I didn’t know to look for a bit higher acidity in Barsac wines, now I need to taste some! I also enjoyed the vineyard photo, it’s so interesting to see all the different soils in the region. Yes, that tad higher acidity makes a big difference for me. It’s interesting to note that a Barsac wine can be less acid and taste like a sweeter Sauternes and vice versa. So it really depends on the winemaker. I love the soil! Nice post, Lynn, particularly your personal observations and anecdotes. The Chateau sounds like a charming place! Thanks Lauren… Doisy-Daëne definitely has more of a friendly family feel. A great Château to visit when you come to Bordeaux! It makes me want to go buy some yummy wine from Doisy Daene right now. I saw some at our local Total Wine store recently. But amongst the hundreds of French white wines screaming for me to pick them up, I was paralyzed. Who to buy… and why? Now I know. This post is useful and loaded with valuable information. Thanks for making my next purchase (Doisy Daene) easier! Glad you liked the information John, and that I helped you identify which bottle to pick up at Total Wine! Thanks for the introduction to Château Doisy-Daëne Barsac I will keep my eyes out for it in the US. I enjoyed your first hand account of Château Doisy-Daëne. I must say I am getting carried away with French dessert wines. I also purchased a Climens from the Barsac region and yes, opened it already. I do like that refreshing lightness and higher acidity. I also saw the Doisy-Daëne at my local Total Wines so, I am sure I will indulge with yet another bottle of French dessert wine over the holidays! Happy Holidays! I can’t wait to track down a bottle of Château Doisy-Daëne Barsac. I love the photo of the red soil! Thanks for sharing, Lynn. I believe most Total Wine stores in the US carry the Château Doisy-Daëne Barsac, as well as the dry (sec) version which is a lovely wine. And that soil! Nice article, Lynn. Only recently discovered how good sweet wines can be if they are well balanced with high acidity. I will refer to your list of Chateaus when I visit Bordeaux! Yes for me, that higher acid in sweet wines seems makes all the difference. Cheers Aswani! We had a Barsac from Chateau-Coutet. Are you famiiar with them? Anyway it was delightful with Toffee Pudding. The wine was labeled “Sauternes-Barsac” Thanks for the great info Barsac and this producer! Yes I’m familiar with Château Coutet and have tasted a few of their wines- the one you tasted- nice to hear it fancies Toffee Pudding!- and Cuvée Madame, another nice sweet. A nice estate in the Barsac AOP that I haven’t visited yet but need to. Thanks for stopping by Martin and holiday wishes to you and your wife! Mark and Lynn- We were boxing up dried fruit and inserting Christmas notes last night. No fruit from California to France; that might be like sending coal to New Castle. But it might taste nice with one of these French dessert wines! I must admit I have not looked at your website in a while. I need to get a glass of wine and learn about your exploits. Seems like you are having a great time. Cheers! The internship sounds like a marvelous opportunity- love that you’ve shared with us. I would love to see the horses in action! While Mark was working in the vineyard then harvest, we spend time discussing what he was doing and procedures at this particular Domaine. I think I learned almost as much as he did. Driving through the vineyards I’ve seen horses plowing here and there- what a sight. I bet your travels will take you somewhere, where you’ll be able to see the same thing Jill!